Well into AMARA’s Construction, Stademos Hotels Taps SKS Studio for Landscape Architecture. In 2015, Stademos Hotels PLC embarked on the construction of its third hotel in Cyprus, AMARA, a name derived from the Greek word Amarantos meaning everlasting. Situated close to the famed royal ancient kingdom of Amathus in Limassol, AMARA joins the company’s other luxury properties in Limassol, the 4-star Mediterranean Beach Hotel and the 5-star Elysium Hotel in Paphos. Stademos promises guests and residents “infinite luxury and wonder,” touting AMARA as an ultra-deluxe sanctuary inclusive of a signature spa, indulgent restaurants with world-class celebrity chefs behind the menus, a grandiose ballroom and a palatial infinity pool. On schedule to open in 2019, this 5-star beachfront property is anticipated to be the most revered accommodation on the island, offering 207 artfully appointed guest rooms and suites, as well as one- and two-bedroom apartments with 180-degree views of the Mediterranean Sea – enjoyed from private balconies. In keeping with AMARA’s ambiance, its accommodations have been inspired by the area’s heritage as an archaeological site and multi-layered cultural influences. AMARA’s design and construction were well underway with San Francisco-based SB Architects when Stademos tapped SKS Studio to provide landscape architecture for all exterior areas, pools and landscaping. Our services still began with the concept stage and are continuing throughout construction. However, since this 5-star sanctuary’s construction was in full swing, existing plans were reflected in our landscape architecture concepts. Layout and dimensioning plans, which fix the size and location of all site elements, structures, roads, utilities, etc. acted as a framework for our designers in this case. SB Architects has created a modern aesthetic, blending clean lines with colossal forms and using materials that are locally sourced. AMARA is a prime example of designing and building in harmony with the environment, using elements such as glass, stone, woven textiles and wood. This direction served as our jumping off point for the project, helping us select hardscape materials and more. At AMARA’s heart is a glittering infinity swimming pool that we designed to complement the property’s clean lines. Foliage from surrounding gardens accent the area and serves to blur the division between the pool and lounge area, making it a true oasis. SKS Studio has worked hard with local landscape experts to ensure that the landscape plant palette celebrates the local Mediterranean climate. Even going as far as hand-selecting olive trees from Greece that are hundreds of years old to be installed on the project. Joining the AMARA project mid-stream, our team is paying close attention to ensure Stademos’ technical and regulatory matters are addressed and approved. Our landscape architecture design was finalized in compliance with budget, local codes and constructability issues, requiring us to be current on Cyprus’ laws and regulations. Drawing coordination is critical, and SB Architects quickly reviewed designs, which allow us to resolve any conflicts before they become expensive problems and delays. Stademos wants our expertise on site, observing construction, especially at critical points, to ensure that the craftsmanship and installation are consistent with the overall design intent. It is an opportunity to collaborate with the other firms, resolving any design conflicts, which may arise to keep the opening date on track. In just the first three months of 2018 alone, the number of tourists arriving in Cyprus was up 29.3 percent over the same time period in 2017, and it is an all-time record for January through March. Tourist visits on holiday, visiting family and friends or on business are up from the United Kingdom, Russia, Germany and Israel, respectively. These numbers, according to the Cyprus Tourism Organisation, are extremely encouraging and should lead to redoubling efforts to improve the tourist product. 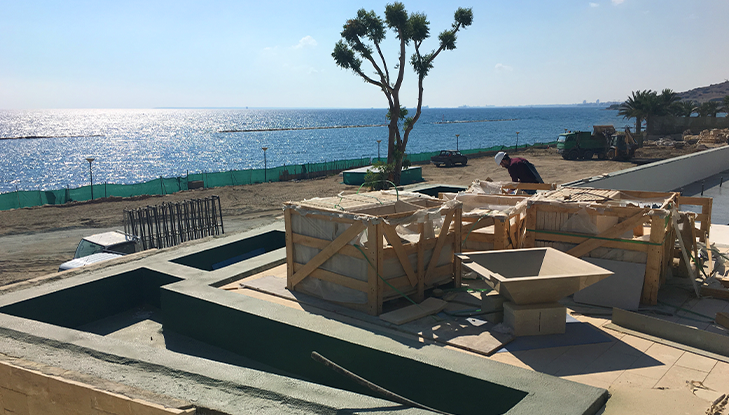 The SKS Studio team is excited to provide landscape architecture design and services for AMARA, working with Stademos Hotels PLC as it develops yet another phenomenal luxury property in Cyprus. It is no wonder that the company and its properties are defining the art of living luxuriously in all of Cyprus’ sun-drenched, beachfront glory.